The relationship between payments and anonymity (which we can label “cash” for short) is far more complicated than it appears. If you ask people whether they want anonymity in payments, they are very likely to say yes, but that’s because they haven’t really thought about it. Jon and I agree on a lot of things. 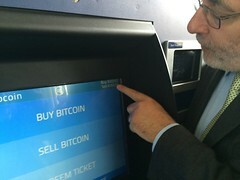 For example, I’m not sure I buy Douglas French’s bullish take on Bitcoin at the Laissez-Faire Club, but I think Jon and I share his take on private currency as part of a spectrum of future currency choices. They way that money works now, with fiat currencies under the control of nation states is a transient implementation. There is no reason to imagine or expect that it is the only, or optimum, way of organising money. It may well be the private currencies, for example, are the future (I have written about this for a forthcoming book on digital currency – details will follow). Maybe what the banking industry is really afraid of is the Amexes and Wal-Marts of the world creating their own currencies and banking systems. Indeed, I was pontificating on same not only in my book chapter but also at the wonderful Cafe Scientifique at our favourite pub down at CHYP End, The Keystone, when they invited me along last autumn. I’m not sure that the banking industry is absolutely as frightened about this as the Bitcoin acolytes think: if Wal-Mart ran the world’s money and Sam’s Shillings were the official currency of the USA, I’d still need to borrow some from Wells Fargo if I wanted to buy a house. So what don’t Jon and I agree on? Well, Gizmodo had an article about the technologies that we will still be using a couple of decades from now. One of them was, as it happens, cash. In the information age, paying by cash is the best way to keep your purchases anonymous. Aside from simply preserving your privacy, paper money is a great shield against identity theft, because the payee doesn’t even get your name, let alone an account number. The government would probably love to end the use of cash, because it allows payees to keep illegal transactions off the books, but paper money is the only form of payment that doesn’t require a third party like a bank to get involved. It does require a third party (like the US government, in the case of Benjamins), but that’s not what I want to argue about. It’s that point about anonymity as a desirable characteristic of a cash replacement technology that I want to drill down into and explore. As society goes increasingly cashless, payment companies will have a larger business, and a more valuable one, in closing the loop for offline transactions and helping deliver customers. The data they possess is without equal; did somebody buy something? How much did he spend? What did she buy? 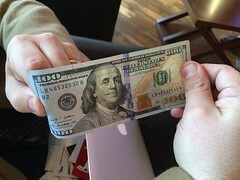 Paper money cannot be tracked in this manner. This last point is very, very crucial because it touches on the privacy issues that will be central to any realistic plan for realising the value of this data. These are perfectly reasonable concerns. But they are a plea for privacy, not anonymity. Now, in some of the online discussions around Bitcoin, this anonymity is held to be most important in a political context, to stop the godamn federal government from taxing the sheeple. But it seems to me that If I disagree with government policy on, for example, taxation then I should either move to another jurisdiction or vote for change. Using cash and not paying my taxes (thereby increasing the tax burden on my fellow taxpayers) is not the right choice, moral, ethically or practically. The right answer is to get society to work out where it wants to set the privacy dial and then get the technologists to implement it. If we are given an unambiguous statement of requirements then we (the payments industry) are perfectly capable of designing a solution. Since no-one seems to know what these requirements are, some form of strongly-authenticated pseudonymous solution seems the right way forward to me. There are, it seems to me, two things wrong with this argument. First, cash is not a requirement for freedom. They have cash in North Korea and they don’t have cash in Norway (well, they do, but only for criminals). Second, the tension isn’t between total anonymity and total surveillance but between the faux anonymity of an industrial society and the managed pseudonymity of the post-industrial society. Let me explain what I mean by each of those points. Freedom is a political term in the sense it is being used here. If you live in some countries, then you don’t have any freedom and it doesn’t matter whether you are using cash or a credit card. I don’t think it helps the discussion one way or the other. Whether you think that Bitcoin is a Zionist plot or the last redoubt against the Zionists of the Federal Reserve (both opinions I’ve heard expressed in the Church of Bitcoin), it’s got nothing to do with democracy. Anonymity makes for a more interesting discussion. I don’t want to live in a society that allows anonymity for all but the smallest transactions. I want to live in a society that provides the appropriate level of privacy. If all transactions are anonymous, then the rich and the powerful are not accountable. 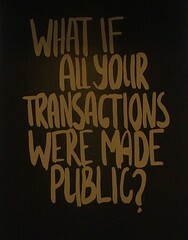 I’d rather all transactions were public than all transactions were hidden. Which means we either continue to obscure and socialise financial information for the sake of retaining a truly fungible and anonymous bearer currency system — i.e. we allow the government to replace the private banking system’s money creation function — or we opt for the sort of transparency and personal accountability that kills the anonymous function of cash entirely. This choice is false. The right solution is privacy-enhanced money (PEM or, as I think I will call it, ?? ?$), not anonymity. Money that remains private in the normal course of events but if there is a fraud or some other crime, or if the police have a warrant following due process, then the veil can be peeled back and the transaction details revealed. I think that when it comes to anonymous cash, the bad outweighs the good. Bitcoin, in an odd way, is a step in the right direction. The blockchain tells me that Wallet X sent a Bitcoin to Wallet Y, but I don’t know who wallet X and wallet Y below to. One might imagine a future version of a blockchain where I don’t know who wallet X and wallet Y belong to, but I know that (say) the “system” does and will reveal so under warrant. So, for example, if you want money from me and you send me a certificate that contains a Bitcoin public key that is digitally-signed by a regulated financial institution, then I can be confident I am actually sending money to my gardener and not an Eastern European fraudster, So who could sign the key? It would have to be someone who has carried out the relevant KYC on the key owner and can keep their personal data secure. Let’s a call it a “bank”, for the sake of argument. Dave, thank you for the great read. if allowed (by policy makers), would you foresee a new cycle of evolution of industry searching for the best class of assets to serve as money? a multitude of competing (and complementing) money issued by private (and public) entities to suit various types of exchanges (local, global, community based, c2b, b2b, online, offline, …)? agree with you on the privacy and its ‘enhancement’ by blockchain-like protocol. This is an amazingly interesting topic – I just got off a call about this, by coincidence. Personally, I tend to think that we will be moving to a larger number of currencies, each more closely associated with specific communities. Will blog some more about this.